Sescom just released a new cable that allows you to monitor audio on your Canon T2i/550D via a USB to 3.5mm headphone jack. The cable requires the Magic Lantern firmware hack to be installed on your T2i. The DSLR-550D-HOCF was designed specifically for DSLR Canon T2i/550D users who employ Magic Lantern firmware in their HD DSLR video workflow. Magic Lantern on the T2i/550D enables the USB AV out port to be used for headphone monitoring during a recording, a must have feature for those serious about audio quality. 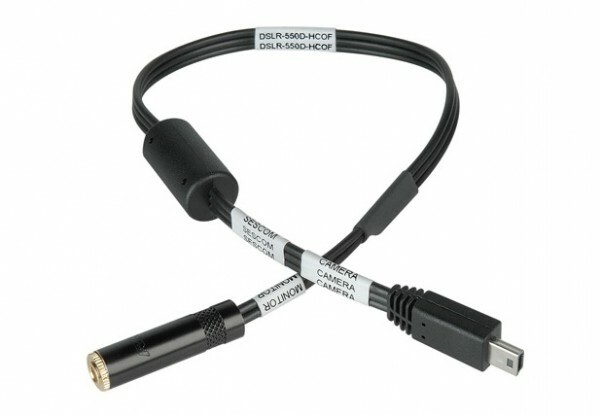 This specialized cable provides an elegant and compact solution that eliminates the need for multiple adapters that are required with the standard AV out cable. They also make a model for the 5D MkII which uses the AV jack. Does this work with out the magic lantern software but with the cable? I couldn’t stand the clipping at the beginning or ending the video clip. Is this worth putting your camera at risk? This just looks like a modded version of the included av cable, i could do that myself, and thomas the one in the link is most likley 5 pin and you 11 pin i believe. On the Magic Lantern website http://magiclantern.wikia.com , they say the headphone function won’t work on a Canon Rebel T3i / 600D. Does anybody know if this is still correct?